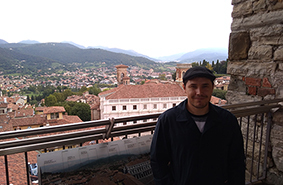 A senior research scientist of Samara Center for Theoretical Materials Science Eugeny Alexandrov was on a professional business trip at the University of Milan (Italy) from August 27 to September 1, 2018 for conducting a joint research of coordination polymers and preparing a research paper. The main goal of the trip was studying exfoliation of 2-periodic coordination polymers. In 2016 and 2017 Eugeny Alexandrov spent two-month theoretical and experimental research works together with Prof. Davide M. Proserpio and Dr. Lucia Carlucci. In frameworks of that research works the scientists predicted exfoliation of 206 layered coordination polymers and synthesized fifty of them. Recently Dr. Atsushi Kondo at Tokyo University of Agriculture and Technology obtained transmission electron microscopy results for obtained samples; the results enabled to determine a size, a form and a crystallinity degree of the derived nanoparticles. In Dr. Alexandrov’s opinion, the present trip to Milan enabled to discuss new results: “We proved that derived nanoparticles have a scale structure, and more important that they are stable in free condition, without a solvent or a substrate. At present we prepared initial text of the joint trilateral (Samara, Milan and Tokyo) research paper. We’re also planning to conduct scanning electron and atomic force microscopy”. By now graphite nanoflakes (so called graphene) are most studied material. In 2010, Andre Geim and Konstantin Novoselov were awarded the Nobel prize for production of graphene and mapping its properties. Nanoflakes of coordination polymers possess valuable properties: high conductivity, catalytic activity, luminescence recognition and sensibility to adsorption of analyte molecules, etc. That is why these materials are prospective for photonics, catalytic organic synthesis and sensors. The research was initiated within the Megagrant of the Russian Federation Government and now is continued in the frameworks of the grant project supported by the Russian Science Foundation.